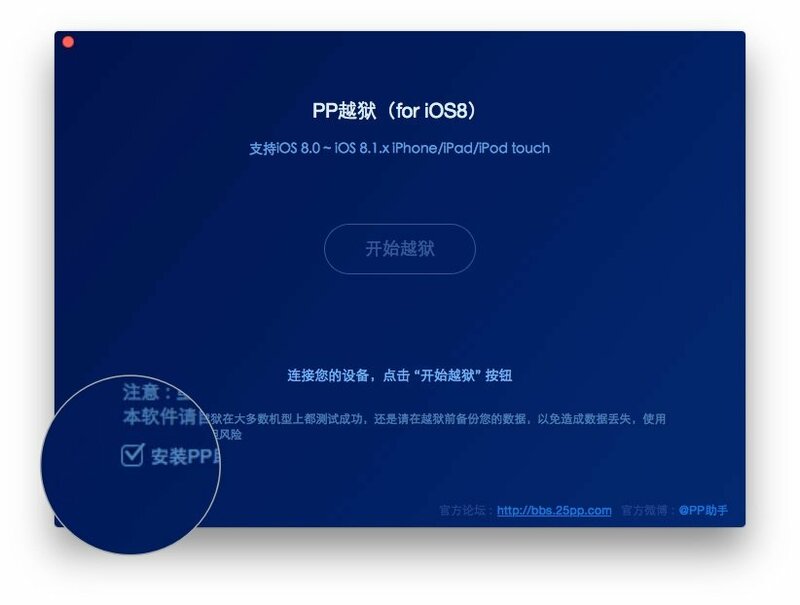 PP jailbreak has been released for iOS 8 by a team of Chinese developers, supporting all compatible devices. PP team didn’t get off to the best of starts when they were associated with an app store containing copied content but have since cleaned up their act and are now one of the most reliable and trustworthy of all jailbreak teams. The jailbreak is a godsend for those still on iOS 8 as it opens up a whole world of possibilities ignored by the newer jailbreaks. An untethered jailbreak, PP does not need to be reactivated when your device reboots, and it is perfectly safe to use. PP jailbreak is only available for Mac users; Windows users should use Taig Jailbreak. Update: Windows Version of PP has been released. Links available below. You must check out the latest iOS 8 Jailbreak tools which might be more stable and have a better jailbreak success rate for your device. Open Cydia and set it up and then re-enable your passcode, Touch ID, Find my iPhone, your firewall and anti-virus. Some users have reported that, after updating Over-the Air, the jailbreak did not work. OTA and Cydia are not compatible so carry out a fresh update using iTunes rather than OTA and then reinstall the PP Jailbreak – it will now work correctly. Don’t forget to let us now how you get on and follow us on Facebook for all the latest updates and jailbreak developments. I have an iPhone 5s on iOS 8.0.2. After a successful jailbreak, my rear facing camera does not work. If you switch to rear facing camera the screen is a blur(will send picture) also after switching, it will not switch back. Camera options are also eliminated in apps such as snapchat. Do you have any fix to this problem? The camera blurr isssue does not have anything to do with the software. Its something with the mechanics of your phone. Anyways , download new jailbreak , ad PP jailbreak is now older. This might solve the issue, but i highly doubt it . Can i ask u Something ? I have a jailbreak on my iPhone 5 s but sometimes most of The time my iPhone get stuck cant do Anything anymore then Its starting up by him self ! how to carrier unlock iphone 5s ios 8 for free ? plz ans me as quick as possible ! PP app has been updated to support latest iOS 8 firmware. Check download links.